BMT Ventipro steam-air-mixture sterilizers provide fast, safe and effective terminal sterilization of liquids in open, sealed or heat sensitive containers. Pure steam is utilized inside the chamber for heating the liquids and over-pressure filtered air is injected into the chamber to compensate for the rising temperature and pressure that builds inside the liquid container. 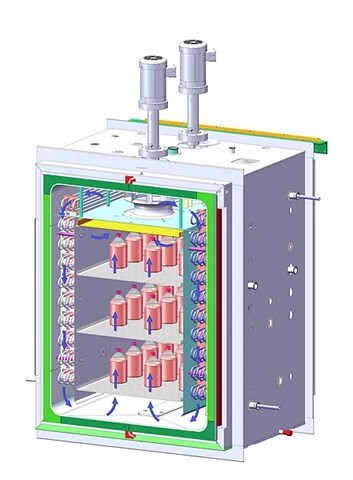 Internal fans mix the chamber steam and air to ensure there are no cold pockets inside the chamber and to provide a uniform temperature distribution across the entire chamber. Rapid heating and cooling is achieved utilizing convection principles. At the end of the cycle, the product comes out dry and ready for labeling. Ventipro sterilizers can be equipped with a vacuum pump for sterilizing dry goods, porous materials, wrapped goods, stoppers, hoses, filling machine parts etc. BMT Ventipro Steam Sterilizers are available in almost any size and capacity. There are no threads in BMT USA Ventipro Steam-Air-Mixture Sterilizer Reviews at this time.